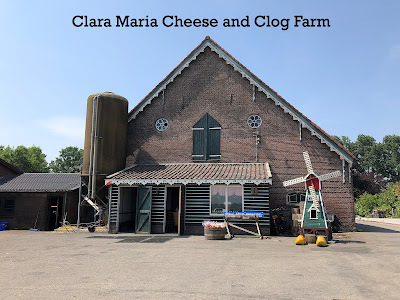 On our way to Efteling, my family took a detour and visited the Clara Maria Cheese and Clog Farm. A family owned operation, this shop and stable was a hole in the wall delight. We lucked out and arrived when their was a lull in visitors. ; a group of families were leaving and a tour bus was an hour from arriving. The farm, whose address was Bovenkerkerweg 106 located in the town of Amstelveen for those interested, was a treat to drive through. We had to follow a road alongside a canal, where there were men fishing in longboats and dozens of residents biking along the path built for them. Cows clustered in massive groups in the fields we passed and slim Dutch houses peeked out from behind high walls, painting quite the picturesque scene as we turned down a tree lined lane and entered the farm. The first order of business was to visit the stable where the cows and chickens were hanging out. The kids were overjoyed to see that they could pick up hay off the ground and feed it to the animals. Nothing like some bovine slime to make young ones cheery. Alex and I managed to tear the kids away with the promise of revisiting them one more time before we left, and we wandered inside the second building on the premises. This housed a large shop selling all sorts of souvenir trinkets and shelf after shelf of cheese. Again, luck was on our side because as we were browsing another American couple asked one of the employees for a demonstration in English, and he rounded us up on his way. It was a perfect situation, because there were only us four and the other couple so it might as well have been a private event. The man (regretfully didn't catch his name but was the grandson of the owners) led a demonstration of how to make clogs and let Landon help him throughout the process. He began with splitting a piece of poplar wood, which is the type they use to make the clogs. Then he used a machine to mold the shoe. And another to carve the inside. A little bit more went in to finalizing the product, but I don't want to go into too much detail in case somebody decides to visit for themselves. However, by the end the wood had a rough resemblance to a clog and we were allowed to keep it! The man then followed the demonstration with some fun facts about clogs, which the nerd in me found fascinating. - By hand, it would take between 2 and 2.5 hours to carve one clog. - The shoes need to be a little bigger than your feet because they won't stretch. Typically, they are worn with thick socks. After years of use, the clogs will mold to your feet. -There are rounded toes and pointed toes. The cows prefer the rounded ones. The pointed ones were used by fisherman to help hold netting when their hands were full. -His grandparent's clogs were massive square ones because they needed to be able to walk and work on peat grass. -Traditional wedding clogs take about two weeks to carve. They were placed on a doorstep and if the girl was wearing them the next day that meant she accepted the proposal. It's an outdated tradition but is often done when a Dutch man is marrying a foreign girl to kind of incorporate her into his heritage. Next on the tour, a girl (again, didn't catch the name) came out and explained how they made their cheeses. My nerdiness was in overdrive getting to learn all this information; I learned so much about cheese in this short time span! The farm houses 120 cows that are milked twice a day. Each morning the workers pour the milk into this huge vat, add something I can't remember, and two cups of resin and let it churn until they are left with curds and whey. They then scoop out the curds, smash it was a lid and Viola! They have cheese. For those cheeses with flavors, they cook the herbs and then add them during the churning process so that they are mixed in and not all just sitting at the top. The cheese is then covered with wax, stuck with a customs sticker, then set on a shelf where it can remain for years so long as they are turned over every few days. - Resin is the lining in a calf's fourth stomach, and it has to be a calf because they only consume milk. It makes the enzyme needed to make cheese. However, because Indians believe that to be part of a cow, they have actually found a wheat that replicated the enzyme exactly and use that instead. -The longer you have the cheese, the more moisture will leak out and that's when you get your Parmesan-like cheeses. Very crumbly and requiring a grater rather than a slicer. - Once you cut into the cheese, you have to refrigerate it, but if it starts to grow mold all you have to do is cut that top part off and the cheese is still good. The mold can only grow on the upper layers. The farm had all sorts of fun flavors that we were able to try. There was a cumin one that tasted that a taco, a nut one that actually was cooked with a seed so it was allergy safe, and the big hit...the garlic and chive flavor. When the girl suggested putting some slices on bread and toasting them to accompany an Italian dinner, Alex was sold. We walked out with two cheeses. The garlic and a regular gouda, and it only cost us 20 Euro for both. A delicious and unique souvenir from our visit to the Netherlands. After our time in the shop, Alex and I took the kids back out to the stable to see the animals one last time. On this go they ran into some baby chicks and walked out to the pasture to see the horses. Add in the donkey at the back of the barn and we'd covered most farm animals. I had read only positive reviews of the Clara Maria farm beforehand, but I never expected to have as much fun as I did. The overwhelming friendliness of the staff really made the difference. Everyone was so nice and patient with the kids and seemed genuinely interested in answering our questions. They were what you want every store and museum in the world to have, people who turn a simple operation into a fascinating field trip. Depending on how quickly our cheese gets depleted, we might have to revisit Clara Maria and enjoy another pleasant afternoon at this endearing slice of the Netherlands.